Yesterday, thanks to the work of our school librarian, we had a special poetic visitor arriving from the Great Beyond. An actress who performs as Emily Dickinson (who lived in nearby Amherst) spent time with my students yesterday morning, talking and acting as if she were Emily Dickinson. She talked of her life and of her writing, and while it is hard to keep sixth graders in Spring in their chairs for (for them) an obscure poet, they were mostly attentive. My student teacher is doing her unit around poetry (ack, I really miss teaching poetry this year), so the timing was right. As the librarian and I agreed, our kids need a variety of styles of performances (we had Mordicai Gerstein not too long ago and he was drawing, and laughing, and energetic with them). And plus, who better to bring back from the dead than Emily Dickinson? What the Poem in your Pocket? Today is Poem in Your Pocket Day, when you are invited to print out or write out a favorite poem and keep it close to you throughout the day. 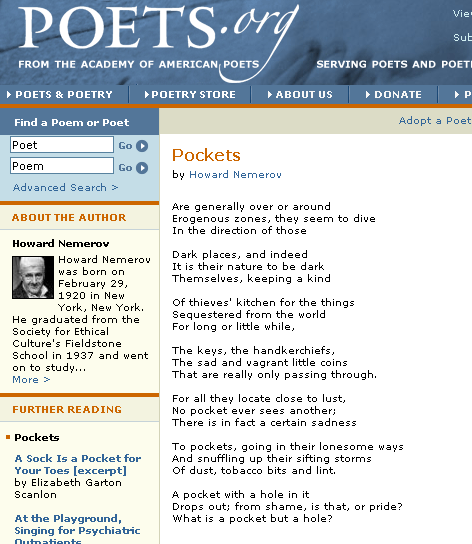 I chose a poem called, eh, “Pockets” by Howard Nemerov. What poem will you carry around with you today? As readers of this space know, I have been writing poems every day over at Bud Hunt’s blog, where Bud has been posting images to inspire writing. We’re almost at the end (which is fine — I’m feeling a little poetry burnout right now) but I wanted to find some way to collect some of the poems together. 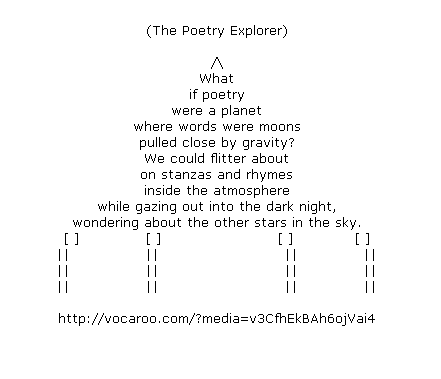 I decided to use Glogster because I could easily add the video poem I did, as well as upload a few podcasts from the month of poetry. I tried to find a good design, and I worry that the page is a bit busy (always an issue with Glogster), but I made this as sort of “Thank You” card to Bud for inspiring me to write this month. I was always glad when others joined along, although I wish more folks would do it. 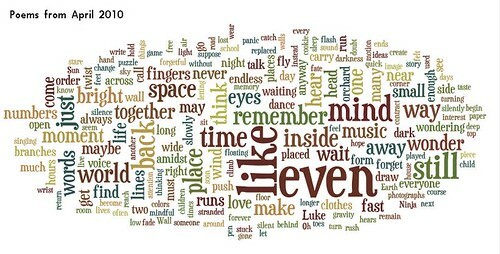 I also like that this glog is part of my classroom glog, so my students have a chance to read some of my poetry and see some of the multimedia work, too. It’s another way of sharing and showing. When I was an undergraduate — majoring in English, minoring in music — I had a professor who seemed very much out of sync with our small state college surroundings. Dr. Peacock seemed to have come from the fabric of New York City’s avante-garde composition scene and what he was doing at our college was never quite clear. He was all about pushing the boundaries of music. And he was all about the “doing” as much as the theory behind what was being done. I felt like an explorer moving into unknown terrain most of the time, and thoroughly enjoyed the experience. I was reminded of him yesterday as I followed a link from Larry Ferlazzo’s blog to a site by Jason Freeman called Piano Etudes, where Freeman has worked to create an interactive site in which the viewer can use fragments of his piano pieces to refashion them into something new. It’s a very visual experience, as Freeman has mapped out how the pieces of a composition might intersection, and you grab elements and pull them together. Then, you can add your piece to the gallery at his site, download the music as an MP3 file and/or get a PDF of the score (see the image above, which comes from the PDF). Inspired by the tradition of open-form musical scores, I composed each of these four piano etudes as a collection of short musical fragments with links to connect them. In performance, the pianist must use those links to jump from fragment to fragment, creating her own unique version of the composition. The pianist, though, should not have all the fun. So I also developed this web site, where you can create your own version of each etude, download it as an audio file or a printable score, and share it with others. 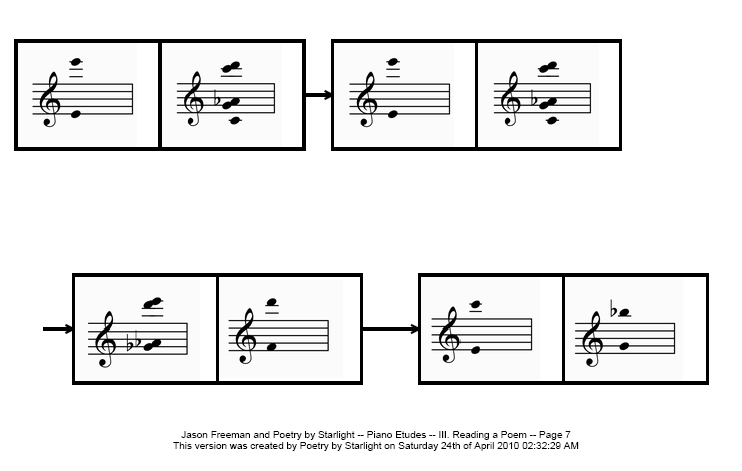 I plunged right in, and created a version of Freeman’s “Reading Poem,” which I called “Writing a Poem by Starlight.” I downloaded the mp3 file, and then write a poem inspired by the music, which has a lot of space and open air to it. Then, I recorded the poem in Audacity, with the Freeman-derivative score as the background music. Give it try. Write some music. Remix and create. 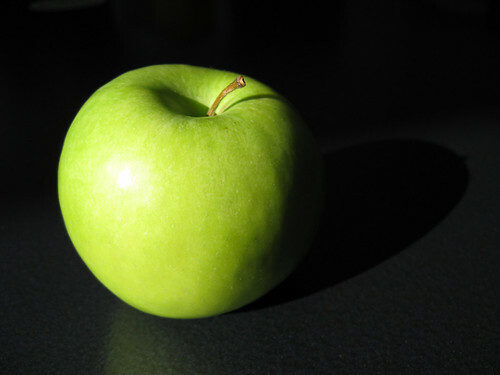 I tried my hand at a shape poem this morning over at Bud the Teacher’s blog, where he has been generously sharing photos as inspiration for poetry this entire month (Thanks, Bud!). The image today was of a spinning galaxy, which got me thinking metaphorically, and then it made sense to try to create a spaceship out of my words. Many of us write in silence, with just our thoughts ringing out inside. This morning, as I was about to move into the 19th day of writing a daily poem with Bud Hunt and his image-inspiration concept (each day, Bud posts a picture and encourages us to write a poem), I thought I would try something a little different. Before I even went to Bud’s site to see the picture of the day, I turned on my microphone and began to talk. My goal was to try to make visible my writing process with today’s poem. I did this because I have noticed how often my poems seem to have little relation to the photos that Bud shares, and yet, the photos are the spark of inspiration. And I write without stopping to reflect on what I am really doing. I go with the flow. But where does the flow come from? That’s sort of what I was after. I realize that this podcast is a bit self-indulgent, but if you have time and interest, I would love for you to give it a listen and see what you think. I’d appreciate some feedback on this kind of on-the-spot reflection. And I wonder, is this kind of vocal writing feasible in the classroom? What if we gave out voice recorders and asked kids to talk as they wrote and edited? What would happen? and my eyes travel these roads to remember. thinking always that this moment may soon disappear. my world crunching in my mouth.